Author and researcher, Sonja Lyubomirsky, maps a path to happiness in her book “The How of Happiness: A New Approach to Getting the Life You Want”. 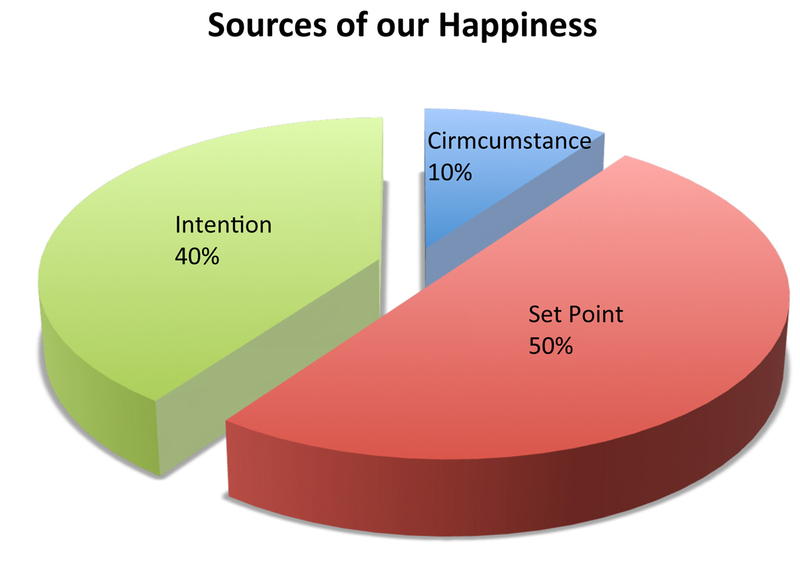 Her research shows that our circumstances account for only ten percent of our perceived happiness. Fifty percent is the “set point”, which according to Lyubomirsky is what we are born with – an inherited happiness closely connected to the happiness of our biological mother. Forty percent of our happiness is a result of our intentionality. If living intentionally could increase our happiness by 10, 20, 30 or even 40% why don’t we? It is actually rather difficult because living intentionally tests our priorities and challenges us to live them out. Action for Happiness posts ten keys for happier living and resources for learning more. It is all about our priorities. When we feel down, depressed or frustrated the best medicine is to take some time to reflect and realize which of our life priorities we have overlooked or forgotten. It is amazing how uplifting, energizing and healing it is to make the choice to define our priorities for well-being and live them out.